This was a collection of short stories that was pure joy to read. (I know! Short stories and I don’t usually get on very well.) 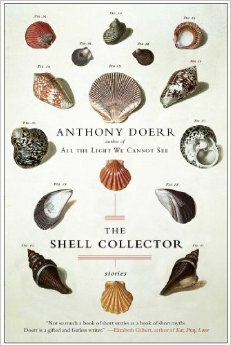 Author Anthony Doerr is a well-established fiction writer and has been widely published, and from this offering, it’s absolutely clear why he is. He is a sickenly perfect writer in every stretch of the imagination, and I just thoroughly enjoyed every story and every page. My experience with short stories is mostly composed of reading short stories that end too soon with reference to their endings or sometimes don’t even finish. Sometimes I feel that the typical short story only tells half a story (and that authors use Po-Mo as an excuse to explain that) or it feels unfinished in some way. But that was not this experience at all. The stories are diverse, but seem to have a common theme of living with the natural world: a man who lives on an island studying shells who becomes a reluctant healer, a lady who had an experience in her younger life and becomes a spirit healer of sorts, a group of US fishermen compete in an international fishing competition… There was also an ongoing theme of water (sea, lake, snow, river) and the creatures who live in it. Each story was down-to-earth and each story was so exquisitely written that it was a joy to read. I don’t mean to sound hyperbolic, but this really was a great collection to read. I highly recommend this title if you’re looking for fantastic fiction writing with good plots. Stories were as long as they needed to be and the plots were compelling. This was great. This entry was posted in Uncategorized and tagged American, Fiction, nature, short stories by lizipaulk. Bookmark the permalink.